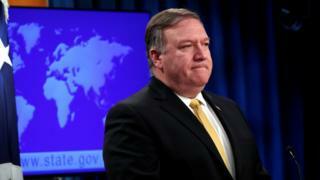 The US will pull out of a decades-old treaty with Iran which was used by Tehran as a basis for a case at the International Court of Justice (ICJ), Secretary of State Mike Pompeo said. Iran took the US to court after it re-imposed sanctions on the back of abandoning a nuclear deal in May. Iran argued that decision violated the terms of the 1955 Treaty of Amity. But after the ICJ ordered the US to ease sanctions on Wednesday, Mr Pompeo said the treaty would be terminated. "This is a decision that is, frankly, 39 years overdue," Mr Pompeo said. National Security Advisor John Bolton said all agreements which could expose the US to ICJ rulings would be also reviewed. Both men called Iran's claims "baseless" and rejected the ICJ ruling. Could the Iran deal collapse? Does US 'Plan B' on Iran risk war? Judges ruled that the US had to remove "any impediments" to the export of humanitarian goods, including food, medicine and aviation safety equipment. It did though reject Iran's call for the ICJ to order the reinstated US sanctions to be terminated without delay. The rulings of the ICJ are binding but the court has no power to enforce them. It is the main judicial organ of the UN and settles legal disputes between member states. But both nations have in the past ignored the court's rulings. Terminating a decades-old friendship treaty with Iran is largely a symbolic gesture. And rejecting an ICJ ruling is not unprecedented. While historically the US has championed the international rule of law, it has reacted negatively to decisions by international legal bodies that challenge its interests - especially to suggestions that its soldiers deployed to other countries could be prosecuted. It has an uneasy relationship with the International Court of Justice and never joined the International Criminal Court. But the Trump administration has taken that up a level, and National Security Adviser John Bolton has been the driving force. He's long argued passionately that globalism constrains US sovereignty. Now he is giving concrete shape to President Trump's unilateralist instincts, working to divorce or distance the US from UN bodies and international organisations like the ICJ. As Michael Hirsh argues in Foreign Policy, Mr Bolton's unilateralism is ideological and Mr Trump's transactional. But together they are undermining major institutions of the global system the US was instrumental in establishing. What were the arguments in court? Iran said the sanctions violated the Treaty of Amity, Economic Relations, and Consular Rights between Iran and the US, which grants the ICJ jurisdiction over disputes. The treaty was signed in 1955 to regulate commercial relations, and both sides used it since to take each other to court. Media captionUS-Iran sanctions: What do they mean? 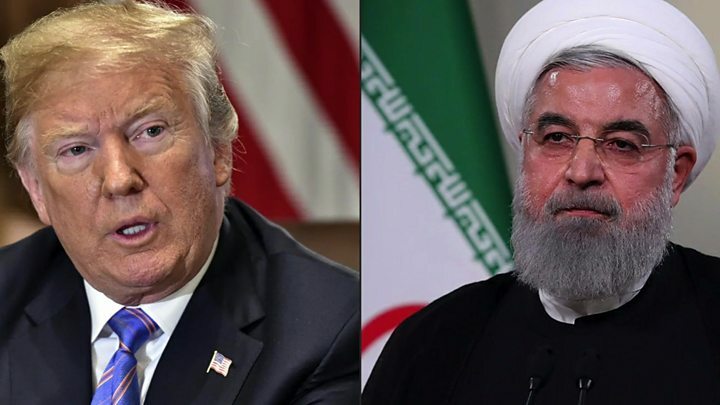 Iran also said the reasons cited by President Donald Trump for re-imposing the sanctions were unfounded because international watchdogs repeatedly confirmed that Iran was complying with the terms of the accord. US lawyers argued that the ICJ should not have jurisdiction and that Iran's assertions fell outside the bounds of the treaty. Why did the US abandon the nuclear deal? The 2015 accord saw the Islamic Republic limit its controversial nuclear activities in return for relief from international sanctions. But Mr Trump said it had "failed to achieve the fundamental objective of blocking all paths to an Iranian nuclear bomb" and did not deal with Tehran's "malign activities, including its ballistic missile programme and its support for terrorism". In an attempt to compel Iran to agree to a new accord, the president reinstated sanctions that targeted the Iranian government's purchase of US dollars, Iran's trade in gold and other precious metals, and its automotive sector. In November, a second batch of potentially more damaging sanctions will be re-imposed on Iran's oil and shipping sectors as well as its central bank. The other parties to the deal - the UK, France, Germany, China and Russia - have pledged to abide by their commitments. But many firms have pulled out of Iran. Does US 'Plan B' risk war? Video What is Iran nuclear deal?